Winner of the 2016 Elixir Press Antivenom Poetry Award. 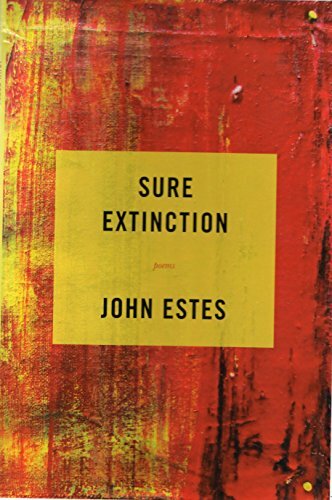 John Gallagher had this to say about it: "In John Estes's SURE EXTINCTION, everything is up for grabs. It starts out with the inscription 'A hymn to fate,' and it's a particularly open fate, open hymn, that follows, where anyone's life is, as he writes, 'like yours . . . little / better than, or better for, moving a comma.' We're inscribed by language, yes, he sees that, but it's more than that, it's the very way we imagine not just who we are, but what we can be, just as we define forever 'as however long / it takes before you start / attaching prefixes.' It's a frightening meditation, but it feels right to me. It feels spot on, because he keeps sight of the possibilities inherent in the meditations of language. 'We are obliged to adapt,' he writes, and it's exactly what we need to remember about the forms extinction can take, and their inevitability."